50 Meanwhile, all his [Jesus’] disciples deserted him and ran away. 51 There was a young man following along behind, clothed only in a linen nightshirt. When the mob tried to grab him, 52 they tore off his clothes, but he escaped and ran away naked. There are 2 light sources that illuminate this scene: the moon (producing a cool blue glow, which is off to the right of the picture) & the 3 torches (producing a warm yellow glow) held by the mob or crowd. In the foreground we can see Jesus, held between 2 men who have their hands on his shoulders. To the left is a member of this arresting party grabbing the young man’s nightshirt mentioned in verses 51-52, with the young man running off. Some Bible scholars believe that figure is John Mark himself (the author of Mark’s gospel). In the background you can see 2 of the disciples running up the slope towards a wall. There is also a third disciple (Simon/Peter, perhaps?) hiding behind the third olive tree from the left. 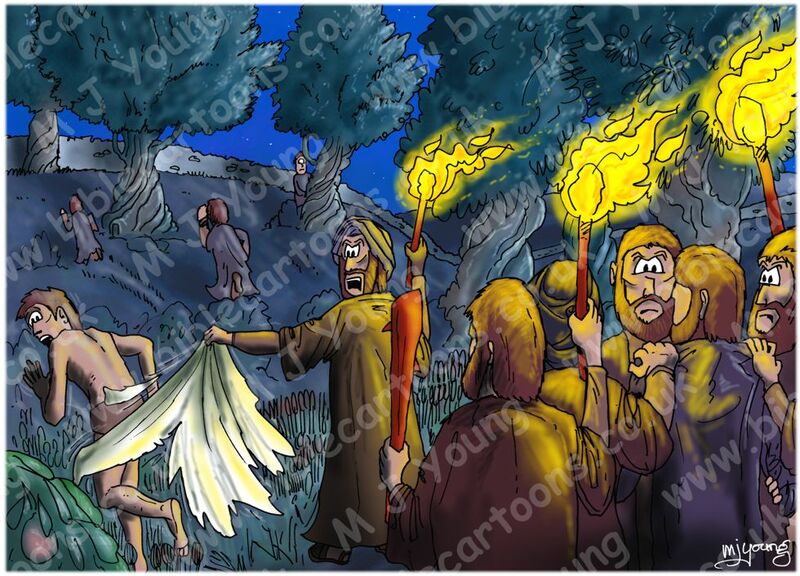 This cartoon is set a few seconds after the previous one (Mark 14 – Jesus arrested – Scene 02 – Arrested) & shows Jesus in the custody of the crowd/mob who came to arrest him. As in the previous cartoon the event took place in The garden of Gethsemane, near or on the Mount of Olives. The scene is viewed from behind the crowd/mob as seen in the previous cartoon. I read on the internet that the Passover was probably at the beginning of Summer. There could have been wild mustard, poppies, crown daisies, & geraniums growing in the garden – these being popular & common flowers that still grow wild in Israel. I have chosen to show Poppies & crown daisies scattered on the ground. A pomegranate bush is growing in the left foreground. The young man who is described as running off naked, is, in fact, still wearing a loin cloth. As far as I understand it, Jews consider themselves “naked” when in an undergarment & inner robe & not wearing an outer robe.